Questions have been received from lakefront landowners along the south shore of West Bay, and the Nippersink Creek Inlet, regarding how close the dredging will come to their respective shorelines, and what relocation of in-lake structures (piers, shore stations, etc.) may be needed. The exhibit shows the planned extent of dredging along these shoreline areas. 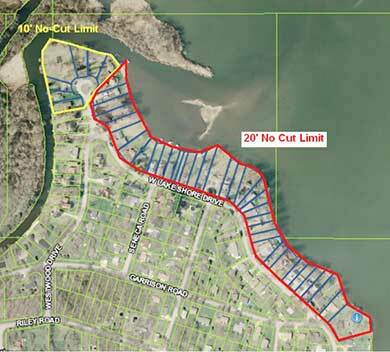 The dredging plans for this area have two different shoreline dredging “no-cut” limits. This defines the closest distance the dredge will come to the existing shoreline. For those properties along the Nippersink Creek inlet where dredging is planned (4209 through 4212 W. Lake Shore Drive), the dredge will come no closer than ten (10) feet of the existing shoreline. For the remaining properties extending eastward along the south shore of West Bay where dredging is planned (4210 through 3922 W. Lake Shore Drive), the dredge will come no closer than twenty (20) feet of the existing shoreline. As a result, in each of these zones, any existing in-lake structures approaching or exceeding the respective 10’ or 20’ no-cut limit will need to be removed to allow the dredging to occur. Failure to remove any in-lake structures from the proposed dredging areas will reduce the amount of dredging that will occur in those areas, and the contractor will not be liable for any damage that may occur. It is understood that some piers near the Nippersink Creek inlet are too heavily silted in to be removed. The dredging contractor is proposing to first cut a navigation channel through this area to allow marina barges to then enter this channel and hopefully extricate the stuck piers before dredging resumes. Anyone with a pier / shore station that cannot be removed should be in contact with their marina to coordinate. The MPOA will advise landowners when dredging operations are completed in their respective areas, and it is safe to re-install in-lake structures. Check the MPOA website www.wlmpoa.org for updates. You can also register your email address with Kathy in the MPOA office and receive email updates on important issues dealing with our Lake. Send your email address to office@wlmpoa.org The MPOA will not use your email address for anything other than messages about Wonder Lake conditions.